So while I use Octopus Deploy and TeamCity for continuous delivery for windows based software, I am now starting to look at chef, puppet and vagrant for deploying non windows stack technology. 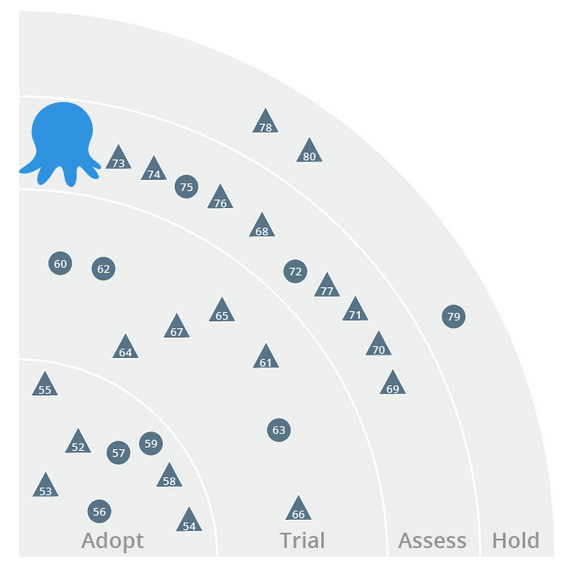 But if you are a windows shop and want to take the headache out of deploying websites and windows services then do look at Octopus Deploy. It makes deploying 10 or times per day a reality and even a pleasure. Even to the point when anyone in the business can do the deployment. What is the Technology Radar? The ThoughtWorks Technology Advisory Board, a group of senior technology leaders in ThoughtWorks, creates the radar. They meet regularly to discuss the global technology strategy for ThoughtWorks and the technology trends that significantly impact our industry. The radar captures the output of the Technology Advisory Board's discussions in a format that provides value to a wide range of stakeholders, from CIOs to developers. Which I think is fair given how new automated deployment solutions are in the .NET ecosystem. What I found interesting is that products like Microsoft's Team Foundation Server are listed in the "Hold" category. Windows infrastructure automation should be adopted, however it still remains more difficult than automation on a Unix platform. Tools like Chef and Puppet are increasing their support, but there are also Windows specific solutions being developed like Octopus. Octopus allows automated deployment of your ASP.NET applications and Windows services and decreases dependency on PowerShell. It can be used with both NuGet using Octopak and TeamCity to create a full build, package, and deployment pipeline.